Want your slice of laid-back, Central Florida living in Marion County? There’s a gorgeous mini-farm in Dunnellon, Florida with your name on it! Located in the equine-friendly Romeo Farms neighborhood and listed at a reduced price, this green, three-acre property is brimming with every amenity you’ve been looking for. The property is close to outdoor attractions at the Goethe Forest and Rainbow River, and is just minutes from the famous Florida Greenway. Plus all of the activities and shopping in Ocala and Gainesville are just a car drive away. This farm features a three-stall barn and a single paddock with wire-and-board fencing and plenty of space that make it the perfect horse mini-farm. The four-bedroom and three-bath home is the definition of Florida elegance, with a stacked-stone facade and white-columned front patio. If you love to cook and entertain, it has the perfect kitchen for all your needs with lots of counter space, stylishly minimalist Shaker cabinets, gas range and stainless appliances. The master retreat is well-appointed with hardwood floors and a huge walk-in closet featuring built-ins to hold every conceivable item of clothing you own and then some. Ever wish you could just enjoy a day at the spa without having to leave the farm? The gorgeous, en suite spa bath has got you covered with a soaking tub, frameless shower and vessel sinks. The pendant lights above the tub and fine tile-work add an extra note of spa-like ambiance. 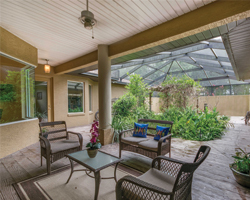 When you’ve had enough of soaking your stress away, enjoy the quiet shade of the spacious lanai, which includes a unique and beautiful terrarium lush with ferns and vines. It’s also screen-enclosed, so you can enjoy the Florida outdoors without the bugs! If you ever feel like getting off the farm for a bit, you’ve got a wealth of options for dining, shopping, and outdoor fun; ranging from rustic to refined. The Goethe State Forest is only 20 minutes to the northwest and offers beautiful hiking, biking and riding trails, as well as fishing and primitive camping. Tubing, kayaking and canoeing opportunities are only ten minutes away at KP Hole Park on the Rainbow River. The famously delicious Blue Gator Tiki Bar and Restaurant is less than fifteen minutes away, situated on the banks of the Withlacoochee River (you can even take an air boat ride after lunch!). You’ll also be a lot closer to the Gulf Coast than you think–Cedar Key is just an hour away. If the big city is closer to your idea of a good time, Gainesville is well within day-trip distance at less than an hour away, and Ocala is half an hour to the east. If you’ve been searching for the best of Central Florida living, you’ve found it! This modern mini-farm is a luxurious yet tranquilly private option for you and your horses — and offers access to town and country amenities alike. For more information on this listing contact Showcase Properties.